H!P members #2: Maasa draws a clear-file featuring all of °C-ute. The three begin rapid-firing their compliments about them. Kumai-san hangs out with Airi a lot as the two are the green tea-loving members of Macchaazu, Maasa says she probably talks to all of them equally, and Chii notes that they all feel like older sisters to her… aside from Chissaa and Mai-chan, which according to Maasa makes Chii’s statement rather pointless. H!P member #3: For the last member, Chii draws the Captain of Berryz Koubou, Shimizu Saki. The three talk about how Saki-chan is so good at everything she puts her mind to — with the exception of drawing. Her dancing, for example, is perfect even though she doesn’t practice at home all that much. Chii asks “Maa-chan” about her sudden change of character even though they’re nearly through the show already. Maa-chan says she thought she’d just go with this character for a while and asks if it’s cute. Chii replies that it is — painfully so. Maa-chan apologizes for being so cute as to cause Chii to be in pain. Kumai-san suggests that they proceed despite Chii’s anguish. Fan mail #1: This fan mail came in the form of the increasingly rare postcard. The listener explains that this is because in their mind, postcards just go hand-in-hand with radio shows. The listener thus asks the hosts what are some of the things that define radio for them. One thing that defines BZS1422 for Chii are the surroundings in which they record the show. For example, the staff always has their preferred brand of tea prepared for them — Chii announces she’s already going on her second bottle of the day, and so is Maasa. Also, their microphones always have their member colors on them, and they even get BZS1422-exclusive tissues. “That’s pretty incredible,” Maasa says. “I mean, of course it’s just a piece of paper slapped on top of the tissue box, but still. The staff’s love for the show really shows.” When they were last recording SATOYAMA, Maasa says they had just the basic grey and black microphones and they didn’t even get any tissues. Maasa doesn’t want to complain, but she says she just feels really cozy when she’s a guest on BZS1422. 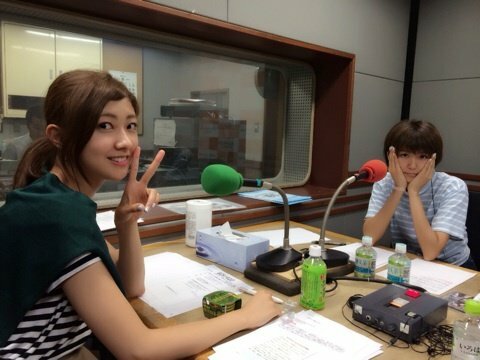 Kumai-san says they’re blessed to have such a great show. For Maasa, the first thing she thinks of when someone says the word “radio” is a certain type of red pen. 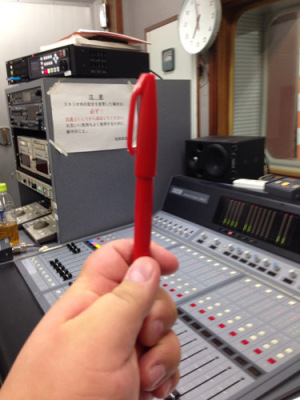 Their director always used this pen ever since their early days of doing radio. To Maasa, a pen like this always made its wielder look like an intelligent, proper adult. The first time Maasa got the opportunity to use one herself, she was really hesitant for a while, asking if it was really okay for her to touch it. She thought it was basically the pen to end all pens. Even to this day that red pen signifies radio to her. Their director is holding one as they speak and Chii announces he’s taking a picture of it right now. Chii wonders why all directors have that same pen in their possession, and guesses that it must be because they’re trying to look — even though you could probably find one exactly like it from the dollar store. 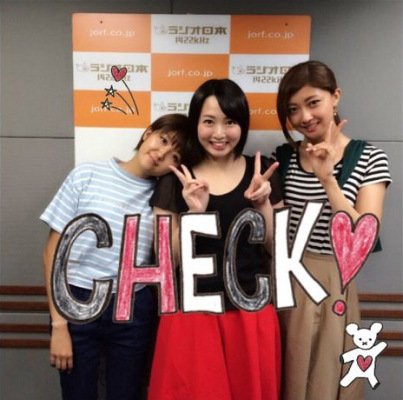 Maasa laughs and agrees with Chii’s assessment wholeheartedly. People who use red pens are posers.